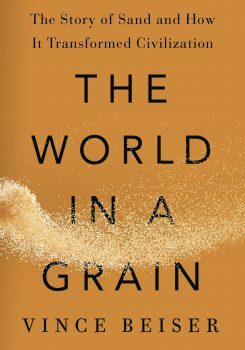 In this excerpt from “The World in a Grain,” beach sand is gold. Illegal sand mining and rising seas are shrinking beaches, but this man is working to replenish them. The following is an excerpt of The World in a Grain by Vince Beiser. Then there are the places where the beach itself is being hauled off. Illegal beach sand mining has been reported all over the world. In Morocco and Algeria, illegal miners have stripped entire beaches for construction sand, leaving behind rocky moonscapes. Thieves in Hungary made off with hundreds of tons of sand from an artificial river beach in 2007. Five miles of beach was stripped down to its clay foundation in Russian-​occupied Crimea in 2016. Smugglers in Malaysia, Indonesia, and Cambodia pile beach sand onto small barges in the night and sell them in Singapore. Beaches have been torn up in India and elsewhere by miners seeking rare minerals like zircon and monazite that are found in minute quantities amid the quartz grains. Even farmers in Scotland and Northern Ireland have been known to steal beach sand to improve the quality of their soil. Perhaps the most notorious heist was in Jamaica, where over the course of a few weeks in 2008, thieves made off with a quarter-​mile stretch of lovely white-​sand beach near the town of Coral Springs. A planned resort under construction on the beach was brought to a standstill; police officials speculated the 500-​odd truckloads of grains were sold to rival developers elsewhere on the island, possibly with the collusion of local police. Five men were eventually charged with the crime, but the case was dropped when a key complainant, an executive with the Coral Springs development company, refused to testify, saying he had received death threats. In some places, beach sand mining is perfectly legal, if ill advised. Beginning in the 1920s, six operations mined sand along the California coast. Five of them were finally shut down in 1989 over concerns about shoreline erosion. The last one, owned by the Mexican building materials giant Cemex, was still sucking up sand from a beach near Monterey as recently as mid-​2017. After years of pressure from environmental groups and state regulators, however, Cemex has agreed to shutter it by 2020. Government officials in Puerto Rico have had to restrict beach sand mining because so many grains were being taken to build tourist hotels that the very beaches those tourists came for were disappearing. Many other Caribbean islands have historically used beach sand as their primary supply for making concrete. And some of the poorer islands sell their beach sand to their wealthier neighboring islands that need it to fatten up their beaches. Mining sand from beaches and dunes was for decades one of the primary industries for the 1,600 inhabitants of the tiny Caribbean island of Barbuda. In 1997, a judge ordered the mining to stop because of the widespread environmental damage, but the ban didn’t last long. “Would you prefer to appear to be protecting the environment and then have your people go hungry?” the chair of the island’s council said to a local reporter in 2013. It’s a question that applies in many parts of the world. As of this writing, the industry’s future on Barbuda was uncertain; a massive hurricane in September 2017 forced the entire population to evacuate. The storm’s damage would likely have been less intense had the islanders not demolished so many protective dunes. Meanwhile, thanks to climate change, the seas are slowly rising, encroaching onto shorelines. Add rising seas to shrinking beaches and you have a serious problem worldwide. As the ocean draws ever closer to buildings and roads, it poses a major and growing threat to lives and property. It also means big business for Bernie Eastman. Eastman is a professional beach builder. On a sunny day in January of 2016 in Fort Lauderdale, he took me for a spin in a sort of all-​terrain golf cart to show me the project he was then working on: Broward County’s latest, $55 million effort to artificially bulk up its shores. “Beach nourishment” is the officially preferred term. We rode along an expansively wide stretch of creamy-​white beach for a mile or so, the Atlantic on one side, villas and hotels on the other, until the sand abruptly dropped off in a miniature cliff about five feet high. From the base of this declivity, the shoreline shrank into a narrow belt of tawny sand. Does More Sand Always Mean A Better Beach? The tawny grains, replete with seaweed, shells, and bits of coral, were the ones that nature put there. The white ones, unadulterated with even a speck of foreign matter, were deployed by Eastman. Those grains had, just a few days ago, been dug out of a hole in the ground over a hundred miles away in Florida’s interior. Eastman was dumping thousands of tons a day of them onto the shore to fatten up the beach. “When we started, waves were lapping up against people’s houses,” said Eastman. Having blocked the natural processes that used to feed beaches, people are now replacing them with artificial ones. Beach nourishment, also known as beach replenishment, has become a major industry. More than $7 billion has been spent in the United States in recent decades on artificially rebuilding hundreds of miles of beach nationwide. Almost all of the costs are covered by taxpayers; much of it is overseen by the federal US Army Corps of Engineers. Florida accounted for about a quarter of the total, according to researchers at Western Carolina University. Hundreds of beaches in other countries around the world are also regularly restored with sand brought in from somewhere else. It’s a lucrative business. Eastman is a compact, middle-​aged guy with a weather-​beaten face adorned with a scrap of white beard and mustache. He tops it all off with a cowboy-​hat-​shaped hard hat. Eastman’s father was in the construction business, and Eastman and his three brothers grew up greasing the trucks. By his own account, Eastman barely graduated from high school. But he took a bunch of night courses to learn things like project estimating, and started his own contracting business in 1994. His company did all kinds of contracting work, including a little beach renourishment, until the real estate market crash in 2006. Eastman realized that he would do better to rely on the steady forces of erosion and the government funding earmarked to fight it than to tie his fortunes to the vicissitudes of the real estate market. “When the market dried up, we reinvented ourselves,” he says. Today Eastman Aggregate Enterprises does nothing but beach nourishment, all over Florida and in neighboring states. Eastman has five of his own trucks and forty-​plus people working for him. His company hauls in about $15 million per year. All told, Eastman Aggregate would dump a million tons of new sand on Broward’s beaches over the course of several months. The grains are mined from an inland quarry a couple of hours drive away. Trucks haul that sand down the highway, squeeze their way in between the villas and hotels, and dump it on the shore. Excavators load the freshly delivered sand into hulking yellow dump trucks, which ferry it to the edge of the renourishment zone. Small bulldozers then push the grains into place, extending an evenly proportioned beach out into the surf. “We’re putting ten thousand tons a day into the ocean,” said Eastman, with no small pride. Hauling and placing sand with trucks is both considerably slower and far more expensive than the more common method, which is to dredge sand from the sea bottom and blast it onto the shore through floating pipes. The problem is that over the last four decades since beach nourishment began in earnest, Broward County has used up all the sea sand it is legally and technically able to lay its hands on. Nearly 12 million cubic yards of underwater grains have been stripped off the ocean bottom and thrown onto Broward’s shores. There are still some pockets of sand on the seabed, but dredging them is forbidden because it could damage the coral reefs they sit next to. The same goes for Miami-​Dade County to the south. In Palm Beach County to the north, most of what little sea sand remains was being sprayed onto its slenderized beaches during my visit in 2015. There is lots of sand left off the coasts of three other Florida counties farther north. They haven’t worked their beaches quite as hard as the tourist meccas to the south, and the continental shelf up there extends further out before dropping into the deep ocean, giving them a larger area to dredge from. Miami-​Dade has asked for help, but the northern counties have so far refused to share. They don’t want to find themselves in Miami’s position thirty years from now. “I’ll fight the Army Corps taking even one grain of sand from our beaches,” thundered a state senator from the region in 2015. Desperate Miami-​Dade officials are now talking about importing foreign mercenaries, in the form of sand from the Bahamas. This island nation, which is less than two hundred miles from Florida, does have beautiful sand and recently agreed to allow it to be exported. The sticking point is an American law, passed at the urging of the dredging industry, that bans federal funding for beach nourishment projects that use non-domestic sand. And since the federal government typically covers more than half the cost of such projects, Bahamas sand is pretty much off the table. A few years ago, Broward County was even considering using artificial sand made from recycled glass; that turned out to be technically plausible but ridiculously expensive. Which leaves many towns in southern Florida no choice but to dig their sand from inland quarries and haul it to the coast one roaring, diesel-spewing truck at a time. Tourists and locals hate the noise and traffic, and county officials hate the extra cost, which can be easily double that of dredged sand. But it does have some advantages. The inland mines, with their elaborate sorting and washing machines, can deliver sand of a precise spec—the exact size, shape, and color county officials deem appropriate for the beach. “You pump sand from the ocean floor, you don’t know what you’re getting,” said Eastman. That’s not exactly true; sea sand is examined closely to make sure it is suitable for a given beach before the regulatory agencies will allow it to be dredged for nourishment. But land-​mined sand can be sorted, sifted, and cleaned to a uniform standard. The grains that Eastman was emplacing were all about the size of a salt grain, all the same silver gray, unadulterated with stones or shell fragments. Their color was approved using the Munsell color order system, a visual index of hues created in 1915. The sand is tested at the mine, at every 3,000 tons, and every 500 yards on the beach after it’s in place to make sure it’s up to spec. The waves will gradually mix in shells and other organic matter, so in a few months it won’t look as obviously artificial as it does now. Whatever you may think of the process, the beach Eastman is building is magnificent: miles and miles of soft, thick, even sand. On a stretch completed just a few days earlier, retirees were lounging in sun-​facing deck chairs, kids were building elaborate castles, and couples were strolling barefoot. You’d never know the sand came from a giant pit many miles away, and that this beach was open water just a couple of weeks ago. At the same time, renourishment is the embodiment of a Sisyphean task. This particular beach is only expected to last about six years before it needs more upkeep. Excerpted from The World in a Grain by Vince Beiser. ©2018 by Vince Beiser. Published by arrangement with Riverhead Books, an imprint of Penguin Publishing Group, a division of Penguin Random House LLC. Vince Beiser is a journalist and author of “The World in a Grain: The Story of Sand and How It Transformed Civilization” (Riverhead books, 2018). Gary Greenberg uses 3D microscopes to inspect the diversity of sand grains.